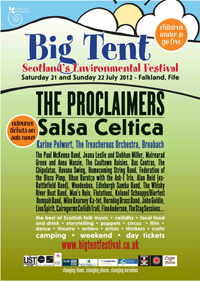 BIG TENT TICKETS - day * weekend * camping. Some advance camping prices still available. Download the festival timetable to start planning your weekend or enjoy the full programme. On-line - there's a small booking fee per ticket transaction as well as the standard credit/debit card fees. On payment you'll get an e-ticket and bar code - keep hold of this because this is your ticket. Local outlets are selling weekend, day and car parking tickets (not camping or campervans) until Thursday- Fayre Earth (SOLD OUT), Pillars of Hercules (Falkland - cash and debit cards only) and Coda Records (Edinburgh - cash only), the Doghouse (Dundee - cash only), Bandwagon Musical Supplies (Perth - cash only), Myres Newlands (Cupar - cash only), Earthy Edinburgh - (Edinburgh, cash and debit cards) - found at Ratcliffe Terrace, Canonmills Bridge or Windsor Place (Portobello) or Greener Kirkcaldy (cash only). On the gate - day, weekend and camping tickets will be available to buy on the gate. CASH only. On-line purchasing advice - refer to the price guide below. Please note there is a limit of 10 tickets per transaction. If you have any issues with the on-line ticketing, call us on (9am to 5pm, Mon to Fri) or email (we will respond within 24 hours). Campervans - we are now fully booked. Unfortunately we have no facilities for caravans. Yurts - new to 2012. If you are interested in hiring a yurt for Big Tent, contact Red Kite Yurts for more information. Camping Package 2 - family-only large camping pitch without showers in our traditional site. Admittance for a maximum of 2 adults and up to 4 children under the age of 16, inclusive of weekend festival tickets and car parking. Advance price £140 (gate price will be £150). Campsite 2 – one adult and up to 2 children - £73. Gate price will be £80. Festival weekend tickets - £50 (admits 1 adult and up to 2 children). Festival day tickets - £30 (admits 1 adult and up to 2 children). Information for visitors who are accompanied by a registered carer. One registered carer accompanying each visitor with disabilities or special needs will receive free access to the Big Tent. Simply buy your own ticket (from an outlet or online) and ensure that you bring appropriate ID on the day (such as a myfife card with a "C+1" symbol) to ensure access for your carer. Only one carer per visitor – all other members of the party must pay the standard ticket. Information on disabled car parking. There is limited disabled blue badge holder car parking close to the festival site. If you wish to reserve a space, please email us at . This parking is free but numbers are restricted. Big Tent access for visitors with limited mobility/disabled visitors. We are endevouring to provide as much access as possible to visitors in wheelchairs. However, please be aware that because the site is a hilly field, some access may be restricted. In such instances we will do our best to assist with getting visitors to their chosen venues. No animals except guide dogs are allowed on the festival site. 1. Caravans are not allowed - they will not make the tight turn required to get in to the car park - don't even attempt it! 2. Check the Ticket Terms and Conditions for full information on what buying a ticket means. 3. A limited number of tickets will be available on the day at full price but organisers cannot guarantee this. The Big Tent is organised by Centre for Stewardship. Any profits that are made at Big Tent go directly back in to the work of the charity - but Big Tent costs a lot of money to put on!! We look after the designed landscape of Falkland Estate and care for the A-listed House of Falkland with its arts and crafts interiors. Over 200,000 folk walk through Falkland Estate each year so we've lots of paths to look after! We run other activities during the year about food, wood and craft. If you are interested in any of the other work that we do, please get in touch with us on or email .